I just called the local Cummins service center about this oil. They have it in stock and it's $73.00 a gallon. Run this oil and you tires will never wear out, The mpgs will increase, The uoa will show negative wear metals as the oil rebuilds the engine as you drive, Good stuff. "The only one endorsed and recommended by Cummins..." Hmmmm....keeps your new Cummins diesel RAM within warranty? According to the MSDS, it's got some pretty exotic base oils, including 50% ester (and I suspect this is a bio-based ester), and 30% PAO. 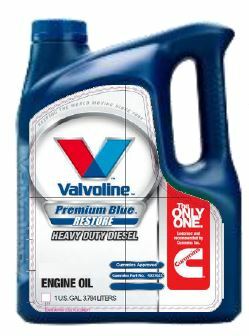 This was developed specifically for Cummins by Valvoline and is only sold at Cummins service centers. It is specifically used to clean up and keep clean the inside of the engine. Hence "Restore". According to Terry Dyson, this specific formula is a very exotic blend. I was going to try it but for now that is way past my kitchen pass money. I'd try it, if anyone can find a $53 rebate per gallon. Premium Blue vs Royal Purple. It looks like Valvoline has entered the boutique market. How many people with Class 8 vehicles are going to use this when $13.00 per gallon Delo or Delvac and Rotella etc will allow over a million miles OTR. 12 gallons @ $73.00 per gallon! A thousand dollar + oil change. I hope it saves a ton of fuel! It must come with coupons for the lot lizards at select truck stops across the nation. This is not designed to be used full-time as a replacement for regular HD engine oils. It was developed by Valvoline in conjunction with Cummins engineers to address a specific problem some of their engines were having with excessive carbon buildup on the rings, which would cause them to stick and send oil consumption through the roof. Cummins TSB150163 goes into detail as to when and how to use this oil to clean out an engine that is suffering from this problem. Once the engine is cleaned out, Cummins recommends Restore be used for one OCI per year thereafter to prevent the carbon buildup from recurring. Compared to the cost of a tear down and ring replacement, $1000 for an oil change is chump change. Well if Cummins (and the other brands) would rely solely on SCR for NOx control and quit making the engines eat their own feces via EGR, then they might not have that ring carbon buildup. But it is pretty sad that they build engines that need a one OCI a year dose of this stuff. $730 for the typical Cummins ISX. That is 7 oil changes (just the oil) on bulk Delvac, Rotella, or Delo at the local Mack dealership lube shop I use. For a typical ISX, it is usually 5 oil changes a year (25,000 mile intervals). So the yearly oil cost would go up substantially. 5 oil changes for $500, or 4 for $400 and one for $730 for a total of $1130, again, just for the oil. Over 200% annual increase in oil costs. Yet one more reason I will more than likely never get a Cummins again. Not after getting burned on two ISX's. I had a great fondness for their N-14, but I have no brand loyalty. Not when it costs $30K for a engine. I guess 10w30 in an ISX, especially during break-in wasn't such a good idea after all. Last edited by userfriendly; 10/22/16 05:54 PM.